Waiting on Wednesday is a weekly feature hosted by Breaking the Spine in which we share upcoming releases! Seventeen-year-old Violet’s entire life has revolved around one thing: becoming Erica Silverman, an heiress kidnapped at age five and never seen again. Violet’s father, the best con man in Las Vegas, has a plan, chilling in its very specific precision. 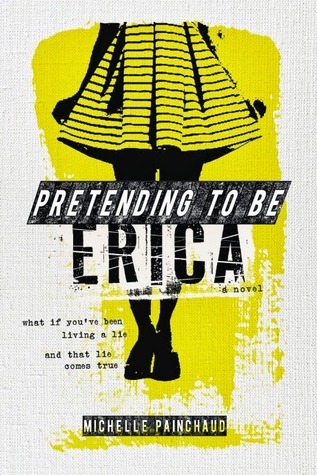 Violet shares a blood type with Erica; soon, thanks to surgery and blackmail, she has the same face, body, and DNA. She knows every detail of the Silvermans’ lives, as well as the PTSD she will have to fake around them. And then, when the time is right, she “reappears”—Erica Silverman, brought home by some kind of miracle. But she is also Violet, and she has a job: Stay long enough to steal the Silverman Painting, an Old Master legendary in the Vegas crime world. Walking a razor’s edge, calculating every decision, not sure sometimes who she is or what she is doing it for, Violet is an unforgettable heroine, andPretending to be Erica is a killer debut.